Play the classic pencil and paper game of "Dots and Boxes" on the PC, against a friend or an intelligent PC opponent. currently includes options changing the board size and opponent strength, selecting who starts and taking back moves. There is info on how to play and stats are recorded. No installation is required and to delete the program just delete the folder. For security reasons, you should also check out the Dots and Boxes download at LO4D.com which includes virus and malware tests. Additional screenshots of this application download may be available, too. 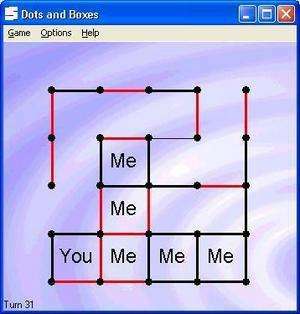 Dots and Boxes has a presence on social networks.